germ@namur: My stay in Köln ! Our second semester has just started in Namur and I’ m pretty sure that this one is going to be quite different (that is to say for me and I suppose for the other Erasmus students too) from the previous one. A few words of explanation are in order! I spent the first semester at the University of Cologne in Germany, where they have their own way of doing things … as they do in any other country I’m sure. I’ll try to explain in this brief blog contribution what Ana and I have been up to for these last couple of months! Let’s start with a little piece of advice to all you future Erasmus students out there! The first thing to do after you have been selected for the Erasmus-adventure is to look for a student room because these are very hard to find! Luckily Ana found accommodations for both of us in a small city (just outside of Cologne) named Hürth. Our lodgings were absolutely perfect; we shared our little house with a very nice and helpful German girl called Janne and a Chinese girl (Su), whose main occupation was eating! Unfortunately Su only spoke ‘Chinese English’, a version hard to understand for anyone who hasn’t resided in Asia for at least a decade. I didn’t spend a lot of time with her; so my English hasn’t changed for the worse!!! 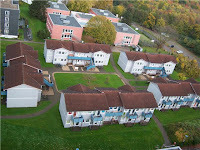 As for the German language, I practiced it with Janne and the other Erasmus-students who lived in the area. Unlike Namur Cologne is quite a big city. It has a lot to offer. That is why we were very grateful for the numerous means of public transport that we could use. Indeed it only took us 30 minutes by railway to reach the centre of Cologne. 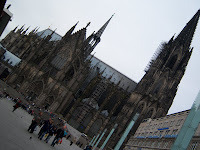 Once there, you are tempted by the many shops, museums, restaurants, snacks-bars and of course the cathedral, the famous ‘Kölner Dom’, which is one of the symbols of the city. When we found out that you could get to the top of the cathedral, we decided to give it a go! So on a sportive day, Ana, Benjamin (who was there on a visit) and I climbed the 509 steps to the top in 20 minutes (Benjamin did in 15 minutes). When we finally arrived, we were met by the most beautiful panorama over the city and its surroundings stretching as far as the eye could see. After this tiring but rewarding exercise, we spend the rest of the day in a more relaxed way, namely by visiting the zoo!! 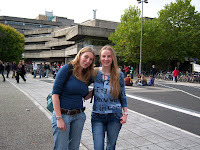 On a more serious matter, we discovered that the academic system in Cologne is not exactly the same as in Namur. First, you have to choose your own courses as well as register for them online. Believe me this is not as easy as it sounds. I’ll spare you the details but let’s just say that I spent a lot of time on the internet trying to understand the complicated German system. Secondly, Germany isn’t fully aware of the ECTS points! This caused quite a problem when we had to explain to the various professors that we needed X credits points! Most of them seemed to know what we were talking about; but others just answered “Keine Ahnung!” (No idea). Another problem we encountered was the fact that in Germany the first semester only finishes in February, whereas in Namur the second one already starts on January 26th! So Ana and I spent our last Erasmus week trying to explain to everyone that we really needed our papers as soon as possible because we had to return back to Belgium. Quite exhausting! But most of all, Erasmus is not just a great linguistic experience; it is also a cultural one. Indeed, by meeting students from all over the world, you learn a lot about different cultures. This gives you the opportunity to improve not only your language skills, but also to become more independent. So if you get the chance to study in Cologne, don’t hesitate because it’s absolutely worth it!! It will guarantee you fun memories for the rest of your life!